Tornadoes and downbursts in a lab: The WindEEE facility tests wind dangers. How many fans does it take to create a twister in a lab? 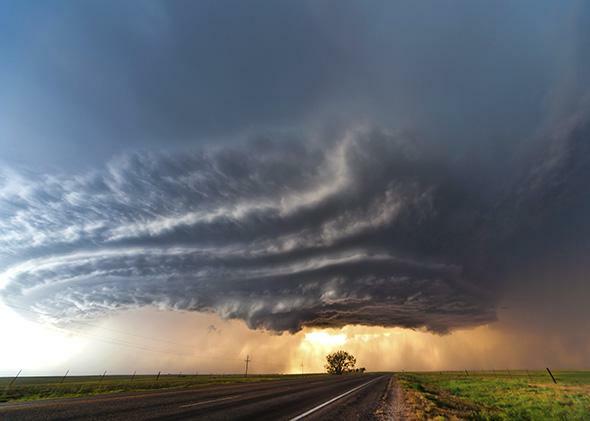 A tornadic supercell in the Great Plains. The wind tunnel has evolved—we can create twisters and other phenomena at the touch of a button, says Maryam Refan, a researcher at the Wind Engineering, Energy, and Environment Research Institute (WindEEE) in London, Ontario, Canada. Beyond the lab she has chased—and caught up with—a dozen tornadoes. What is the WindEEE facility? It’s a wind research center that is very different to conventional wind tunnels. For a start, the wind chamber is a hexagon 25 meters across. In the lower part of the chamber, we have 60 fans on one wall and eight directional fans on each of the other five walls, and in the upper chamber are six huge fans. All are individually computer controlled. What can you do with a setup like that? It’s very versatile. We can create straight flows but also rotating ones to simulate tornadoes and downbursts. To picture a downburst, imagine turning on a tap: The water falls fast, and when it hits the sink, it spreads out. A similar thing happens with air, and it is very dangerous to aircraft. We can create a 5-meter-wide tornado inside the chamber. A tornado is a combination of rotation and suction. By angling the airflow from the fans around the lower chamber, we control the rotation of a tornado vortex, and we create the suction by running the six huge fans in reverse. The beauty of our tornado is that we can move it along the ground at 2 meters per second. Have you tried standing in that swirl? Yes, but the whole flow is scaled down—the size, the velocity. So if I stand in the vortex, it’s very, very gusty and hard to keep my balance, but it won’t pick me up. With the straight flow, wind speed gets up to about 40 meters per second. In tornado mode, 30 meters per second. How can you tell where the wind is going? The simplest way is using smoke. We can also put helium-filled soap bubbles in the flow, which are neutrally buoyant, and take pictures to see the flow’s behavior. We have sensor arrays too. What’s been done with WindEEE so far? We became operational in October, and have so far tested wind loading on full-scale roof-mounted solar panels. We’re also looking at the effects of a tornado on buildings: We aim to find out if tornado wind loading should be included in building codes. What other projects are you running? We’re partnering with the European Union as part of a project called Horizon 2020. Turbines in a wind farm can interact with each other, affecting the airflow between them. We simulate that flow and then model different wind turbines, types of rotor control and so on. It’s about extracting as much power as you can from wind turbines. What do you most enjoy working on? I’ve chased real tornadoes, so our tornado is my favorite. But the facility is versatile. For example, we’ve looked at the effect of downwashes—akin to downbursts—on a remote-controlled airplane. Have you flown the plane into the tornado? [Laughs] No. The thing about tornadoes is that you can see them, so pilots don’t fly into them. Downbursts can be invisible. But we have the plane, so maybe one day we’ll fly it into the tornado and let you know what happens.